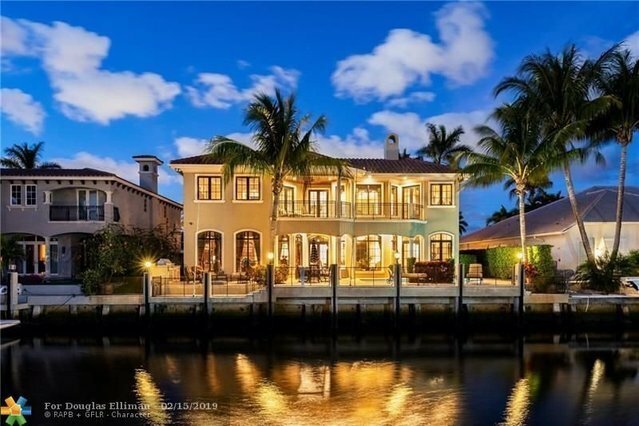 This luxurious property features quick Intracoastal ocean access and no fixed bridges with 80' of water frontage, and a concrete dock for a 60'+ yacht. The property was built on concrete pilings. This home includes a full home generator, impact glass windows, heated pool and marble backyard with a summer kitchen. interior has 5 bedrooms and 5.1 bathrooms, a dramatic living room with 23â€™ ceilings as well as a gourmet kitchen with a subzero appliance, an elevator, library/office, and a fireplace. Custom cabinetry throughout with floor to ceiling cabinets in the study, three-morning bars with refrigerators. The property is a smart home which includes features like lighting control, speakers, sound system, TV, air conditioning, security cameras, and door locks with remote viewing.